Heat a small cast iron pan and break the chili into pieces and roast in the pan including the seeds on medium heat for 3 to 4 minutes. Keep aside. Heat a medium heavy pan with olive oil. Add the onion, garlic and ancho chili. Saute on medium heat for 4 to 5 minutes. Add the cumin, tomatoes and stock. Bring to a boil and simmer for 2 to 3 minutes. Add the homini and simmer for 10 minutes. Take off heat and transfer to a blender and in batches, blend the soup until smooth with some chunks. Return to the pan and add the beans. Bring to a boil and add salt to taste. 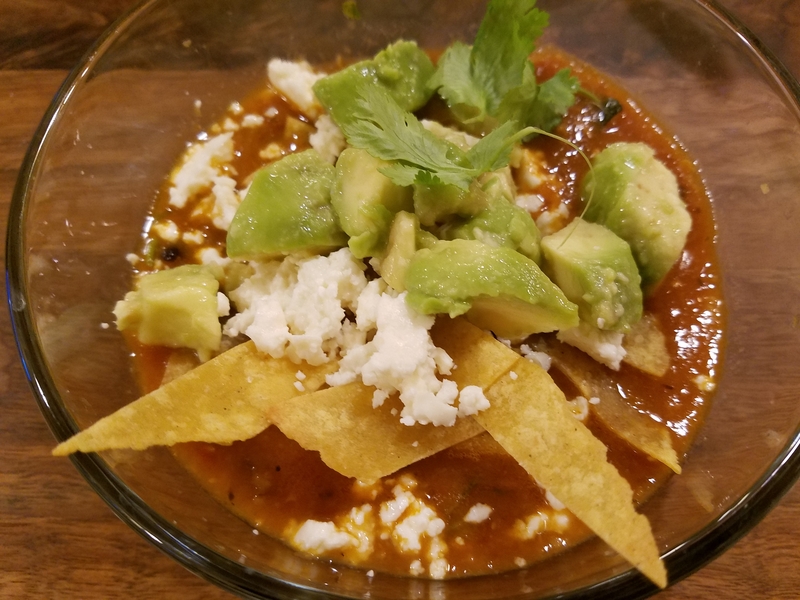 Serve soup topped with avocado, tortillas chips, queso and cilantro. I love, love creating something completely different with my leftovers in the fridge. I had the grilled chicken and plum sauce from yesterdays posting. I decided to reuse them through the week and create quesadillas. My favorite tortillas to buy right now are the habanero lime ones from Trader Joes. They are not super spicy but have a nice kick to them. It was a very quick meal to put together which is very convenient through the week. I paired it with some mild mozzarella cheese and the quesadillas were delicious. I served an avocado salad and a glass of refreshing Rose!! Heat a non-stick pan with the olive oil. Add the tortilla. Place the shredded cheese and the chicken pieces on the tortilla. Drizzle some sauce and top with the other tortilla. Cook well on both sides or till the cheese melts. Cut and serve with salsa. Quesadillas are very popular in our household. My daughter absolutely loves them. 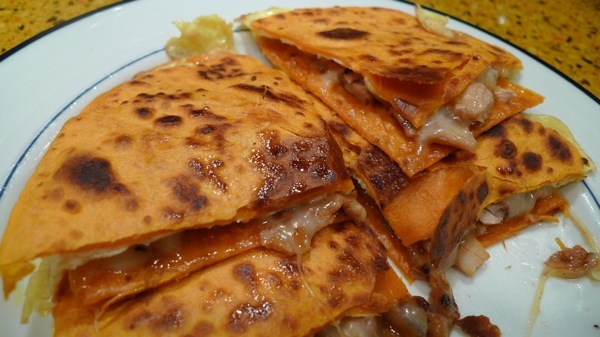 I don’t have a problem making them for her as I use whole wheat tortillas and low fat cheese. I usually pair them with snow peas or a salad on the side and we are both happy. If you are cooking for the big game, I humbly suggest this fabulous recipe. This week has been very hard for me to come up with recipes- so the night before, I have been asking my husband and daughter for ideas. They have come up with some great ones. The night before last my husband suggested a dish with polenta. It got me thinking of the big game and maybe I should post another chili recipe for this weekend. I went to the market and bought some fresh chicken thighs and drumsticks. I also bought a can of beans because that is what one adds to chili- right? I love beans in chili but it kind of bothers me that both the meat and the beans have the same mushy texture. So, I decided to keep them separate. That is how I came up with this very delicious dish. I made a sauce with three different dried chillies and cooked the chicken till the meat was falling off the bones. In the meantime, I put the relish together. I am not sure how I came up with the apple idea. I was looking for the crunch factor and since apples are in season- it was an easy choice. I also made some yummy guacamole which I served on top. Did I mention I served the chili on polenta? Yup, and it was delicious. For the big game, I would suggest corn bread or tortilla chips. Lots of garnishes including shredded cheese, chopped onions and of course the fabulous relish and guacamole. Have fun eating, drinking and watching this Sunday! Place the onion and wrapped garlic on a small cookie sheet. Drizzle the onion with some olive oil and salt. Bake for about 30 minutes or till the onion is tender. Squeeze the garlic out and keep aside with onion. Add the chilies and the broth in a saucepan. Bring to a boil and simmer, covered for 30 minutes. Add the chilies and liquid into a blender. Add the roasted onion and garlic. Blend till smooth. Dredge the chicken pieces in the flour and sprinkle with salt. Heat a saucepan with olive oil. Brown the pieces on both sides on high heat. Keep aside and add the tomato sauce and blended sauce. Bring to a boil and add the chicken pieces back into the pan. Bring to a boil. Lower to simmer and cover with lid. Cook for 45 minutes or till the chicken is falls off the bone. Take the chicken out and take the meat off with a fork, shredding it at the same time. Discard the bones and add the meat to the sauce. Bring the sauce to a boil and test for seasonings. Add salt. Cook till the chili reaches desired consistency. Serve with Spanish rice or some creamy polenta. Add the pinto beans and apples into a small serving bowl. Add the lemon juice, agave, olive oil, cumin seeds, salt and cilantro. Mix well and taste for seasonings. Let sit for at least an hour before serving. Serve a few tablespoons on top of the chicken chili and maybe a ladle of guacamole. 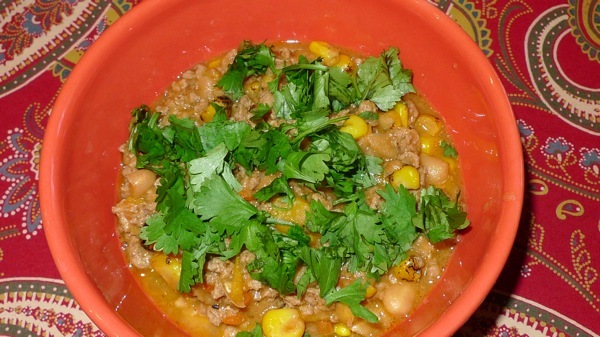 Turkey Chili with Ancho Powder- It’s a real winner! An old recipe revisited for the Super bowl. I have been looking for a chili recipe that delicious yet a little different. I saw this on tv the other day and have come up with my own version. I love ancho chili powder! I use it as often as I can, in salsas, guacamole and stews, etc. Ancho powder is ground ancho (poblano) peppers. It has a mild to medium smoky flavor that goes well with cumin and chili powder in this recipe. Before grinding the cumin seeds, I roasted them first. The roasted cumin has a deeper smokier flavor. I used cannellini beans for the color and their creamy consistency. Since there are no tomatoes, the ancho chili and cumin flavors come through very well. The corn and yellow peppers give it nice sweetness. Also adding the half and half gives a really nice richness, you can substitute milk instead. In case you want more tartness, add a splash of fresh limejuice at the end. Overall it is a delicious recipe. I plan to make some corn bread and serve it with the tomatillo guacamole. You can make this in advance, as the chili sits, the flavors will have a chance to marry! Of course wine or beer should be served! Preheat a large heavy pot and add the olive oil. Add onion, garlic, bell pepper and carrots. Saute for a minute on medium high heat. Add the cumin, chili powder and ancho chili powder and salt. Next add the ground turkey and cook on high heat breaking the meat apart. Next add the beans, corn and chicken broth, bring to a boil. Reduce the heat to medium low and cook for at least 30 minutes. Take the back of a wooden spoon and mash some of the beans in the chili- it will thicken it up. Once reached the desired consistency add the half and half and check for seasoning. Cook another 10 minutes and add the cilantro on top. I love Mexican cuisine, especially since it is full of very strong, bold flavors. I make all sorts of preparations including tacos, enchiladas, salsas, guacamole.. the list goes on. I especially love using tomatillos and all the different Mexican chilies out there. For this preparation I used a poblano pepper- which looks like a large jalapeno pepper closer to a regular green pepper. It sometimes has a bit of heat and once its roasted, the sweetness comes out. I roasted tomatillos, garlic, green onions and the poblano chili with a drizzle of olive oil and salt. I then made a thick sauce by blending all the roasted vegetables and I had a fabulous start to my chili. I had a pork shoulder with bones cut into small flavors for the dish. Any stew meat can be used as long as it can stand up to 2 to 3 hours of cooking. The house smells wonderful while the delicious chili is on the stove. 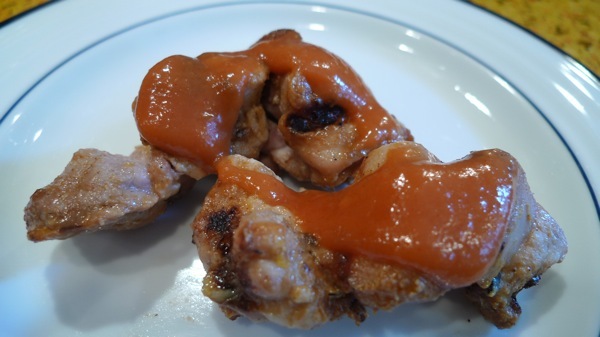 The result is tender, juicy, falling off the bone meat flavored with the most yummy sauce. I served the chili with corn bread, guacamole and Spanish rice. It was a big hit with everyone, especially since it wasn’t too spicy.